3 for Intelligence: Are Blood Angels back in the top tier? Recently I have brought my Blood Angels out of retirement for the last RTT and the local 40k Masters league. I really feel that they have the tools needed to be a top contender in the late 5th edition 40k Meta. In my local meta at least, it seems that people have begun shying away from space wolves and heavy shooting in general. Favoring mid-strength AP4+ shots, instead of the higher strength, lower AP weapons. 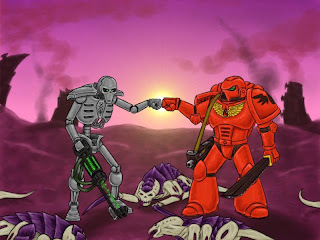 Also, they're bffs with Necrons! In the grim darkness of the 41st millenia, there can be only Bro-fists! In my opinion, BA have 4 solid lists. AV13 spam: The core of this list is Predators, Baal predators, Furiosos, and Librarian/s with shield of sanguinus. The AV13 spam list is incredibly resilient to stationary fire and provides it's own cover saves with shield of Sanguinus and scouting Baals. The all jumper/dev power armour list is very good as well. It takes maximum advantage of the FNP/furious charge bubble as every point you spend is able to utilize the bubble. The double/triple Stormraven list is incredibly fast and dangerous but overall a bit more frail. The Razorspam list just tries to get as many tanks on the field as possible. Generally with las/plas as that is currently the best option for a fast chassis. My current list and opinion of it's matchups after the jump! The Librarian is one of the key components to the list. He provides the shield for when you cannot get cover from your own vehicles. He generally rides with the honour guard in the rhino. The honour guard is not something I see everyone take. I feel they are a much better investment of points than Sanguinary priests. For the cost of a couple priests, you get a unit that can put out a large amount of firepower and still provides you with the same FNP/FC bubble. They are also a much hardier Kill point and provide the Librarian with a safe place to hang out while they advance towards the enemy. This is my backfield harassment unit. He is equipped to handle any situation! Furioso's also rock the AV13 so they are resistant to all but the highest strength firepower. The 10 man squad provides me with a bit more assault backup and the ability to combat squad in the event of an objective mission. The 5 man is just a back up scorer/las/plas enabler. I have found that the scout squad serves quite a few more functions than I initially thought. They are excellent for holding objectives in ruins of course, but they also harass infantry in the open, as well as push back scouting and infiltrating units. Scouting and infiltrating add an interesting pre-game that I hadn't considered until I had 3 units in my army that could do it. The predators are the standard cost efficient variant with no upgrades. they provide an excellent firebase against light to heavily armoured targets. The only downside to them is their lack of a reliable way to hit. No-twin linking and BS4 means I'm only hitting with 2.66 guns per turn. Every miss hurts with a predator. Which is why I take the singleton Dread. He provides some backfield consistency even if he is only shooting at str7. I really like how this list has performed so far. I have played against IG, DE, and C:SM at the 2k point level and nearly tabled all three with a little variation. It matches up very well with most tournament caliber lists. I think it might have trouble with a CC alpha strike list, as I have yet to play against one. But my counter CC elements are strong enough to deal with all but the hardest of CC units. Tyranids, TWC rush, and possibly paladins could pose a serious problem if I am not able to soften them up before they get to my lines. A dedicated scarab farm list is by far the worst matchup. I don't have much in the way to counter scarabs besides weight of fire. Maybe for a TAC list, I should change one of the baals to the flamestorm variant. The only problem with those is their lack of range. If my opponent is smart, he will be able to keep his scarabs on the outer edge of my threat range and only risk losing a couple. Fortunately for me, no one is playing Necrons in the masters league! I would ask you for a game to see how I fair but I have a feeling thats inevetably going to happen soon anyways. Let's do it! Cross blog battle report of doom! Keep it in your pants Dok. I want to do it at the semi's (when all da cookies is on da table). Then of course "cross blog battle report O'doom". If we both get there of course, if not I'll still play you. Pants? What's this pants you speak of?? ?